At Republic West Remodeling, we see lots of kitchen trends come and go. It is easy for many homeowners to get drawn into the “trend of the moment,” only to eventually become disappointed by your design choices a few years down the road. Chances are you will probably only remodel your current kitchen one time. In fact, according to a recent “Remodeling Impact Report” from the NATIONAL ASSOCIATION OF REALTORS®, a complete kitchen remodel is an estimated $60,000. Depending on the size and complexity of your kitchen remodel, the cost may be less or more money. With that kind of investment, most homeowners want to make all the right decisions the first time around. 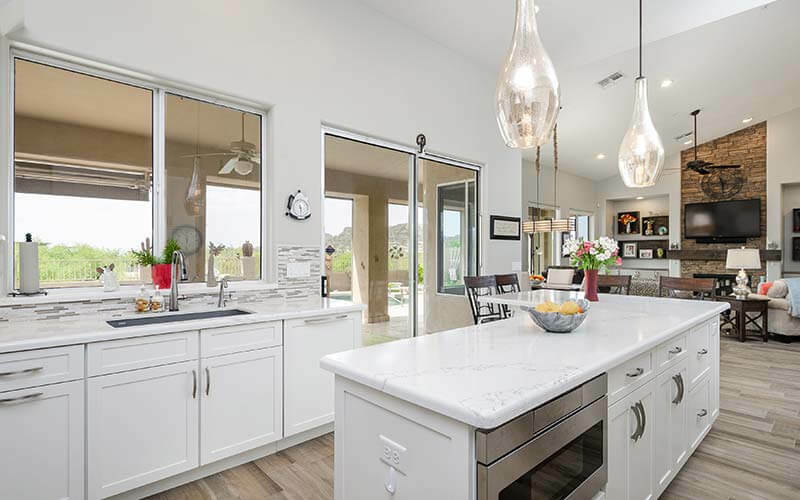 Here are five kitchen features we believe will retain their value, beauty and marketability, all while giving you continued enjoyment. If you are remodeling a kitchen, keep these features top of mind. Perfect for open floor plans. It flows beautifully from a kitchen into adjoining rooms. Very durable. Hardwoods – think oak, ash, and maple – will pay no heed to your kitchen’s high-traffic for years on end. In general, solid hardwood flooring can be refinished approximately 10 to 12 times during its typical 100-year lifespan. Many industry experts say that white is the most marketable color and that it never goes out of style. Even better, white is budget and style-friendly. For example, because it is a standard color for any manufacturer, there are white cabinets, tiles, counters, faucets, sinks and appliances typically available for purchase at a wide range of price points. With clean, simple lines, Shaker-Style Cabinets will forever be in style. An enduring legacy of American style, this type of cabinetry has the knack for looking good in virtually any kind of kitchen setting. Their basic frame-and-panel design simplifies the overall look in a kitchen, making it a welcoming place to be. Furthermore, these plain, simple, clean lines work well with transitional tastes, a beautiful combination of traditional and contemporary styles. In fact, transitional is now the most modern kitchen style, according to the National Kitchen and Bath Association. Ceramic tile shines as a kitchen backsplash, as it guards against moisture, is easy to clean, practically lasts forever and always looks classy. While some view a backsplash as a chance to incorporate pops of color or patterns, neutrals will always remain stylish and blend with any look. Whether it’s ceramic, glass or even cement, tile is a useful backsplash material that adapts itself to any space, any style, and most types of cooking and cleaning habits. At Republic West Remodeling, we believe you can never have too much kitchen sink. Whether you are doing the dishes, filling the coffee pot or preparing/cleaning food, a larger sink is a welcome amenity that makes kitchen tasks easy breezy. For a kitchen sink that will never go out of style, select one that is deep and wide, and can be under mounted for fast counter cleanup. The purpose of this new whitepaper is to help consumers better understand some of the big decisions involved in kitchen remodeling. Readers will find a simple kitchen remodel checklist that provides a road map highlighting all that comes with a kitchen remodel, and more importantly, that can help prevent stressful situations during a kitchen remodeling project. Are you thinking about remodeling a kitchen? At Republic West Remodeling, we offer the best kitchen remodeling contractors in the Phoenix and Scottsdale area. Contact us today to schedule your free consultation.